Congratulations to "Natalija", the winner in Sorchia's giveaway. Thank you to all who participated! 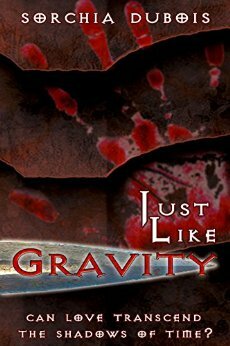 First—I’m giving away an e-copy of Just Like Gravity and a $10 Amazon gift certificate. All you have to do is leave a comment about your favorite villain from literature or the movies and the fine folks at Just Romantic Suspense Blog will choose a winner based on a random number selector at Midnight—on July 29. They will let me know who won the next morning and I’ll get your prizes on their way to you that day. If you win and don’t receive your prize in a timely manner (or if you lose and want to know what the heck happened and when the next contest will occur) you can always message me here or at http://sorchiadubois.com/contact-sorchia/ or email me at Sorchia@sorchiadubois.com. Bad guys! Ya gotta love ‘em. Without a good villain, a movie or book just doesn’t ring true. The late Alan Rickman is and always will be my favorite male villain––urbane, witty, sarcastic, highly intelligent, and honest. The villains he plays couldn’t care less about laws or society’s ridiculous prejudice against mayhem for personal gain. You get the feeling he loves his work. The problem with villains is that women are sorely underrepresented in the world of bad. Oh yeah, you have your Lady MacBeth’s and your assorted wicked stepmothers, but in general, guys dominate the antagonist roles. To make it worse, when a woman does serve as the antagonist, she often has to wear a scanty outfit designed by hormone-crazed adolescents. In the hands of (some) male writers who don’t understand what motivates women, her psycho tendencies may turn into thinly veiled representations of PMS symptoms or menopausal mood swings. Fortunately, not all female villains fall short. Here, in chronological order, are seven of the baddest ladies to grace the silver screen. 1939. The Wicked Witch of the West as played by Margaret Hamilton in The Wizard of Oz. First, Dorothy drops her house on the WW of the W’s sister then she leads the chorus of “Ding Dong the Witch is Dead.” This is not the beginning of a warm friendship. What’s a witch to do? If you have warm fuzzy feelings about the WW of the W, read or go see Wicked—the story from her point of view. 1941 Phyllis Dietrichson (Barbara Stanwyk), Double Indemnity. Film Noir is chock full of gals out to take advantage of poor, unsuspecting, but eternally horny private eyes/insurance salesmen/nightclub owners. Phyllis is all that with an extra helping of sociopathic narcissism on the side. She finds herself married to a rich but unexciting man and stuck with a difficult step-daughter. Her life would be so sweet, if only she could get rid of them both. Enter Fred MacMurray. She plays him like a cheap kazoo. Even Edward G. Robinson can’t save him. Alex Forrest (Glenn Close), Fatal Attraction, 1987. Numbers 3 and 4 are birds of a feather. Both in casual affairs with well-meaning, but callous men who dump the ladies for the next flavor of the month (or to go back to the wife for a while.) Spurned and sick of it, they take action that many women in the audience can only dream about. The men involved may not deserve exactly what they get, but they deserve a version of it. Annie Wilkes (Kathy Bates), Misery, 1990. Every author wants loyal, even rabid fans, but Annie Wilkes takes it to the next level. A little Munchhausen by Proxy, a dash of schizophrenia, and a whole truck load of batcrap crazy. She’s had a horrible life with nothing to look forward to except the next book by her favorite author. You have to feel a little sorry for her—right up until she pulls out the ball peen hammer. Mallory Knox (Juliette Lewis), Natural Born Killers, 1994. I can take all the fantasy horror you want to throw at me. Psychological thrillers are more likely to keep me up at night but true to life stories--reenactments of real events like In Cold Blood or Helter Skelter--scare the bejesus out of me. Juliette Lewis nails her role in this movie so well, I have only watched it one time. Just the thought sends me scurrying around the house locking doors and loading guns. O-Ren Ishii (Lucy Lui), Kill Bill: Volume 1, 2003. An intelligent, beautiful, driven killing machine. She’s an upwardly mobile female in the male-dominated world of contract killings and Japanese Yakuza. Ya gotta give her credit. My new book, Zoraida Grey and the Family Stones, contains villains galore—including a couple of gals who just want to watch the world burn. Ursula Logan, the matriarch of a powerful clan of Scottish witches, controls the remote village of Black Bridge, Scotland, with cruel indifference. But her sights are set on something a bit higher. What can a small-town fortuneteller do to stop her? Zoraida finds clan intrigue, handsome Scottish witches, and danger beyond her wildest dreams. Check out my blog at www.sorchiadubois.com for the latest news on this release—and the chance to win advance copies and other prizes. In my first book, JustLike Gravity, the antagonist is a man who follows the protagonist Anna through three lifetimes. Anna and her lover just can’t get rid of this guy and they suffer the tragic consequences. Now the stakes are higher. Anna pulls together the threads of uncertain memories to face him one more time. Visit my website at www.sorchiadubois.com for more info and to get a copy. A little girl as a villain, Patti McCormick in The Bad Seed. As a female & more so as a small child made this one chilling. You are right about little kid villains. One of my favorite old movies is Village of the Damned and who isn't scared of Damien in the Omen? Thanks for commenting. Louis Ronsard from "All the Queen's Men" (CIA Spies #2) by Linda Howard. He is an arms dealer, but when you find out why he is doing it, you can't feel at least a bit of sympathy towards him. I was really hoping that Linda Howard would redeem him him and give him his own book. I have not read this but it is now on my To-Read list. Thanks, Natalija. That woman is my idol! Except for the killing puppies part. Thanks for stopping by. I think the Wicked Witch from the Wizard of Oz is my fav. She scared me when I was little but I've got some sympathy for her now. I was both repulsed and envious of The WW of the W when I was a kid--fascinated by her. Now I write about witches--who could have guessed? Thanks for commenting, Laura. Hannibal Lecter awed and scared me; he's brilliant yet I don't want to ever come across this type of character in real life. That Anthony Hopkins played him in those movies... I don't have a word. I think he's an awesome villain. I really enjoy reading books with villains that are unknown... it takes you most of the book to figure out who it is! :) As for a fav villain overall, Maleficent... love the magic and dragon form! I have just re-read the Harry Potter books. Severus Snape is fresh in my mind. Since I love the Harry Potter books and movies I would have to say Professor Snape.